It’s difficult to find a championship favorite in the Grand-Am season finale in Saturday’s two hour, 30-minute race at the Homestead-Miami Speedway, where three teams have a chance to win the Rolex Sports Car Series championship. The Gainsco/Bob Stallings Racing team and drivers Alex Gurney and John Fogarty lead the points by eight over Sun Trust Racing and by 10 over the Telmex Chip Ganassi Racing team. 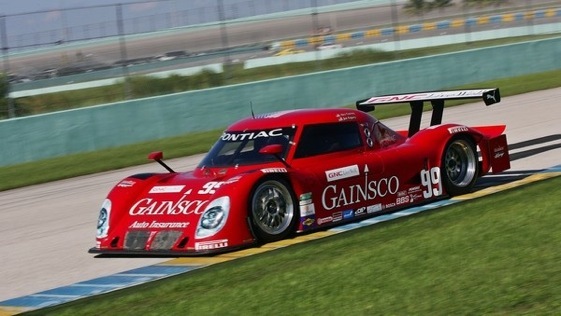 But the team at the top of the table, Gainsco, has not finished well for the past two years in the Daytona Prototype races at Homestead. The Sun Trust duo of Max Angelelli and Brad Frisselle seem to have jelled in their first season together, but still have to make up eight points to pass Gurney and Fogarty. The Ganassi drivers, Scott Pruett and Memo Rojas, have one victory and a third place finish in the previous two seasons at Homestead, but have the most ground to make up. Qualifying on Friday mirrored the points standings. Fogarty won the pole, his fifth straight for Gainsco. The Sun Trust Dallara was second on the grid with Frisselle behind the wheel and the Ganassi team ended up seventh. In what is anticipated to be a hot, humid day in the Daytona Prototype coupes, caution flags and strategy are very likely to come into play on Saturday. The Ganassi duo led 51 of 99 laps to win in 2008, but the race included nine yellow flags for a total of 40 laps. In the afternoon prior to the Indy Racing League’s finale on the Homestead oval, the Rolex Series participants will race on the 2.3-mile, 11-turn road course starting at 1 p.m. The track is the third event of the 12-race season on a combined infield-oval road course. If the first two events at the Daytona International Speedway on this type of configuration are any indication, the competition will be close at the end of the race as well as in the championship points standings. Gurney, who will be starting his 50th race with co-driver Fogarty, said a bookend to the team’s first Rolex Series championship in 2007 would reflect the consistency of Stallings’ organization, which fields a Pontiac-powered Riley chassis. Angelelli welcomed a new co-driver this year as Frisselle replaced team owner and veteran chauffeur Wayne Taylor in the team’s Ford-powered Dallara chassis. That’s resulted in two victories this year, including a classic duel to the checkers in Daytona in July with Gurney won by Angelelli. The Italian driver says momentum or track configuration have little to do with his preparations for the finale. The team is coming off a runner-up finish at Salt Lake City and a victory in Montreal. Pruett is seeking a third victory this season with Rojas and to add to his impressive string of professional road racing championships, which includes two titles in IMSA GTO, three in the Trans-Am and two Rolex Series titles. The Ganassi team, quick out of the box with its Lexus-Riley in Thursday’s practice, spent much of the rest of the two sessions working on tire wear with the series standard Pirellis. Maintaining track position despite caution periods will be more important than pitting for fresh tires. Dirk Werner and Leh Keen need to each drive 30 minutes to share the GT title in the Farnbacher Loles Racing Porsche GT3. Kelly Collins is the only driver who can catch them for the championship. But he will need to finish first or second in his Pontiac GXP.R while Werner or Keen fail to score points.